Delhi is the third largest city of India and it is the seat of one of the world's largest democracies is a combination of Old Delhi-the capital of muslim India and New Delhi-the imperial city, which was created by the British as Modern India's capital. Delhi is a unique blend of tradition and modernity. 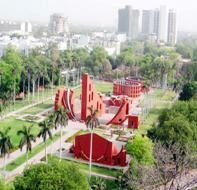 It is an architectural college of parks and flyovers, historical buildings and skyscrapers. Here people live in different cultures, languages, states, traditions and countries in complete harmony. Planning a trip to India? 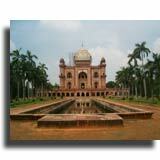 Choose from several beautiful Delhi hotels all at a great price! The city is situated on the western banks of river Yamuna at one side and the other side is protected by the ridge and the Aravalli hills. Delhi's history goes much further back in time that the 13th century. In 1955,excavations at the Purana Quila revealed that the site was inhabitated 3000 years ago.Prithivraj was ruling Delhi when Muhammad of Ghur iinvaded India, and died fighting the Invader at the Second battle of train in 1192.Qutubddin had however commenced chose to become the Sultan. In 1199 Qutdbbin raised the Qutab Minar either as a victory tower or as a minaret to the adjacent mosque.The Sultans successor and son in law, Iltutmish, completed it. 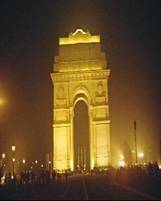 In the six decades since the creation of New Delhi as the capital of British India, the city has undergone a sea change. This is basically a Punjab Festival but celebrated in Punjab as well. It is celebrated with bonfire dancing around and popcorns, nuts and sesame in fire. This is celebrated in winter. This festival is celebrated on the 14th of January and on this occasion the sky is filled with multi-coloured kites of different patterns and dimensions. All age groups fly kites and take on bids to cut each others kite string. Diwali another common festival of lights is celebrated with the same enthusiasm as the rest of the country. There are versions of origin of this festival; the most popular is of Lord Rama's return coronation to Ayodhya after his 14 year exile. The festival is held around Sharad Pournima in the month of October at the Qutb Minar complex. Evocative and hypnotic melodies as well as the refined dances are presented by various famous artistes of the country. Diwali: Diwali (Deepavali), the festival of lights and fireworks, is celebrated throughout the country during Oct-Nov to celebrate Rama and Sita's homecoming after their exile in the Ramayana. Festivities include illuminating the houses by lighting of oil lamps and firecrackers, and the exchanging sweets and gifts. This is a national festival celebrated on Jan 26th.National flag is hoisted in all cities. It stages a magnificent military parade with regiments in full dress and band which starts from Rashtrapathi Bhawan passes Indian Gate and ends at the historic Red Fort. Devotees of Lord Shiva celebrate this on the amavasya night of Phalgun where they remain awake on the preceding night listening to hymns and sacred texts. A spectacular horse show is organized in mid-February. Many flower shows are organized in Delhi by the Government,YMCA and Horticulture department in the month of February. In early October, a festival specific to Mehrauli, in Delhi, takes place. This is the Phulwalon-ki-Sair or the Flower Sellers Procession, which originated in the 16th century. The highlight is a procession of people carrying decorated floral fans, which are blessed at the shrine of the 13th century Sufi saint, Khwaja Utb-ud-din Bakhtyar Kaki and at the Hindu temple of Jogmaya, both in Mehrauli. The procession ends with a formal ceremony at the Jahaz Mahal, a 16th century pleasure resort by the side of a lake. 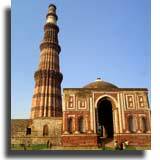 Delhi Tourism organises the popular Qutub Festival in October. Musicians and dancers perform at night by the city's 12th century landmark, the Qutub Minar . This festival gives tourists a glimpse of the cultural grandeur of India.elhi by the Government.During the Mango Season the different varities comes to this market and people taste this various varities. This is a very vast monument on the banks of river Yamuna.This fort is occupied by number of palaces, mosques and gardens in its campus. The square chamber of the Dargah is adorned with verandahs and arched gateways. Domed roof of the building has vertical stripes of black marble and is crowned by a lotus cresting. Even the area surrounding the tomb is considered as sacred. Many Muslims, including the royals, have been buried here. The rush for the Dargah is exceptionally heavy during Id and the Urs fair held twice a year. Moth ki Masjid, also known as "the mosque from Lentil" now lies deserted and secluded. This mosque was built during the rule of Sikandar Lodi around 500 years ago and has a legend attached to its origin.Made up of red sandstone, the Delhi Moth ki Masjid boasts of a small semicircular dome and windows with latticework screens. 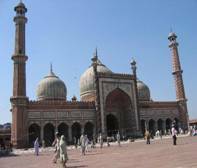 It is believed that this mosque served as the private mosque of Sikandar Lodi's minister. This monument was built as a token of love by Shah Jahan to his wife Mumtaz Mahal.This is one of the splendid monuments and wonders of the world. It was a culmination of Indo-Persian architecture. One of the most beautiful temples in India, the 40 m high Lotus Temple is also known as Bahai Temple, and is built in the shape of a half-opened Lotus flower. Situated near Bahapur village, it is the seventh Baha'i House of Worship in the world. Build by G. D. Birla in 1938 this beautiful temple is located in the west of Connaught Place. The temple is dedicated to the goddess of wealth and prosperity. The temple has fascinating gardens and lawns. 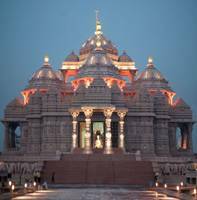 Popularly known as the Birla Mandir, the temple is one of the finest architectural specimen of India. An embassy of the spiritual world,standing tall on a hill top,an oasis of sacredness and spirituality,it is visited by millions, Indians and Foreigners alike, to worship and appreciate the gorgeous deities. Located beyond the Qutab Minar in Mehrauli, this complex of temples is dedicated to Goddess Durga. Build in South Indian style the temple complex is spread over a large area with beautiful lawns and gardens. During the "navratras" devotees come from near and far. Near the Police Station, Chandini Chowk the beautiful golden domes of the Gurudwara Sisgunj immediately strike your eye. It commemorates the site of the ninth guru of the Sikhs, Guru Teg Bahadur's martyrdom. Gurdwara Majnu ka Tila is situated on the Grand Trunk Road, in the Timarpur region of New Delhi. This shrine is dedicated to Guru Nanak, who hallowed this place during his visit to Delhi in the 15th century. Situated at the south end of Bhai Vir Singh Marg in New Delhi, the Roman Catholic Church of the Sacred Heart was designed by Henry Medd. One can clearly see the Italian influence in its structure. The facade of white pillars, supporting the canopy, looks beautiful and attractive. This is a quite famous temple and is located in the Gokal Pura area and well connected to the city by the Ramratan Road. This temple reflects the religious diversity of Agra. Lal QUila', made of red sandstones one of the most magnificent monuments in Delhi. It was built by Emperor Shah Jahan in 1639.
when India gained her Independence on 15th August, 1947. 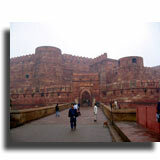 Old Fort of Delhi is believed to be situated on the same site where the city of Indraprastha once stood. As per the great Indian epic Mahabharta, Indraprastha was the capital city of the Pandavas. Now standing mostly in ruins, the Old Fort of Delhi once served as the seat of administration of a number of glorious emperors.The other attractions of the Old Fort of Delhi include the mosque built by Sher Shah in 1541, a lake with boating facilities and Zoological Park situated nearby. 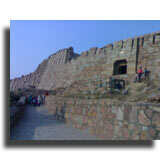 Then, there is Sher-Mandal, a double-story, red sandstone and marble octagonal tower. A soaring stone tower,72 metres high was built by QUtub-ud-din Aibak in 1193.The tower has five distinct storeys,each with a projecting balcony.The base of the Minar is 15m in diameter and the top just 2.5m in diameter,an amazing piece of work.At its base is the QUwwat-ul-Islam Mosque,the first mosque to be built in India. A 7m high iron pillar stands in the courtyard of the mosque. Designed by Lutyens,is the official resident of the President of India.It is an imposing structure with 340 rooms,constructed high up on a Raisina Hill.On its either side are the impressing office buildings - North and South Block. An elegant example of early Mughal architecture, the tomb of the second Mughal emperor also houses the graves o his wives. Mahatma Gandhi was cremated here in 1948.The sprawling site on the banks of the Yamuna is marked by a brick platform flanked by an eternal flame, surrounded by lush green lawns and imposing boundary walls of concrete. India's first Prime Minister Jawaharlal Nehru was cremated here in 1964.Adjacent to Raj Ghat it is flanked by lawns and foliage of many variety. Nehru successor,Lal Bahadur Shastri was cremated here. Memorial to the legendary farmers leader Charan Singh,who was also Prime Minister briefly in 1979. 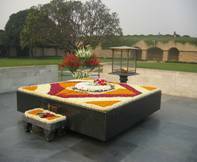 The site is opposite Raj Ghat and was built as a memorial to the legendary leader of the backward communities Jagjiwan Ram. 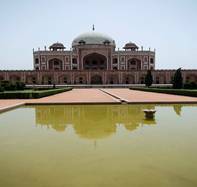 It is set in a beautiful garden,criss crossed by water channels.Built in 1754 for the prime minister of Emperor Mohammed Shah,the tomb itself,with ornate carvings and an imposing Mughal dome is worth. Meaning "old fort"stands on the site that is believd to the Indraprastha,the capital of the Pandavas in the Mahabharatha epic.The small lake in front,is popular for boating. This observatory was built by Sawai Jai Singh of Jaipur.Samrat Yantra the largest structure,is a gigantic sundial.The other five instruments plot the course of the planets and predict eclipses. Dedicated to Laxmi Narayan the main shrine has images of Lord Vishnu and his consort Laxmi. A beautifully landscaped 3 acre garden on a hilly terrain with a statue of Bhagwan Mahavira seated on a Lotus over a raised platform of white marble.About 52 metre from the road levelit is visible as one drives on the Mehrauli road near the Qutab Minar. Gurudwara Bangla Sahib is situated on the Gole Dakhana round about on a Baba Kharak Singh Marg.As the story goes the eightht Sikh Guru,Guru Harkrishna Sahibiji,appointed as guru at the tender age of five and three months was attributed with miraculous healing power. Here on the 12th day of Decmber 1911 His Imperial Majesty King Gorge V,Emperor o British India accompanied by the queen Empress in Solemn Darbar announced n person to the Governors,Princes and people of India his Coronation celebrated in England on the 22nd day of June 1911. A village found 600 years ago around the Hazrat Nizamauddin's Dargah one of the Sufism's greatest shrines.The tomb was built to one of the renowned of Saints of the Chistia order,Nizamuddin Aulia.Another important monument is the tomb of Amir Khusrau,a celebrated Urdu poet and the founder of one of the most popular forms of the North Indian Classical music. This used to be the burial ground of Lodhi Kings.Today the place is highly favoured spot for the citiens of the capital for picnics,jogging leisured activities and winter ambling. This park is near AShoka Hotel in Chanakyapuri is a well landscaped garden full of flowering shrub.A group of three eneormous trees provides a focus on the awn near the statue of Lenin.With rolling lawns,magnificent trees,flora and fauna at its best,Delhi truly is a city of Parks and gardens. A spectacularly designed picturesque site developed in 20 acres located at Said-ul-Ajaib in southern part of Delhi around 2kms away from Qutub Minar.This garen is an amalgamation of colour,fragrance,texture and form with a unique of 500 bels producing soothing sounds in its backgrounds. 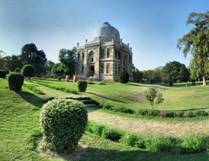 A paradise for morning walkers,has picnic huts,approachable from Hauz Khas Village.It is near the Delhi Lawn Tennis Association. Designed by the west German zoo specialist,Hergenbeck.It is between PUruna QUila and Humayuns tomb. Located near the Sarai Kale Khan behind Humayun tomb.Spread in around 20 acres,this park provides lusty green and peaceful environment to the people. Immediately after the Ghiyasuddin's tomb,towards the south is one of the most beautiful drives in Delhi with the lust greenary and pink bougainvillea bushes on both the sides. Along the road is the entrance to the sanctuary which covers an area of 26 sq kms. Along the road, just beyond the Delhi Harayana border, amidst the barren and rocky landscape, is Surajkund with a man made lake nearby.Every year a crafts fair is held here, which attracts tourists from all parts of India. 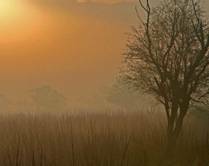 This is situated 46 kms away from Delhi and houses numerous migratory birds in winter. Chandni Chowk - The common Man's market with old world atmosphere from garments to house hold goods, rare antiques, traditional sweets, food etc. How To Reach This Bazaar? Co naught Place - Textiles, leather goods etc. How To Reach This Bazaar? Dariba Kalan - Traditional jewellery and silverware. Lajpat Nagar - Readymades and jewellery. How To Reach This Bazaar? Palika bazaar - Air conditioned market - handicrafts,electronics and readymade garments and leather. How To Reach This Bazaar? Sunder Nagar - Paintings and antique jewellery. Delhi has two airports, one international named Indira Gandhi International Airport (IGI Airport) and the other domestic named Palam airport.Delhi is well connected with domestic and international flights, to all the major cities within and outside India. You could travel to Canada and by visiting Vancouver you will be able to discover a multicultural state with an important Indian population. Almost all the major airlines have their flights operating from Indira Gandhi International Airport of New Delhi. The Indian Railway with their modern and organized network connects Delhi to all major and minor destinations in India. 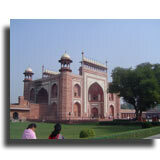 The city has three major railway stations at New Delhi, Old New Delhi, and Nizamuddin. Delhi is well connected, by a network of roads and national highways, with all the major cities in India. The three major bus stands in Delhi are Inter State Bus Terminus (ISBT) at Kashmiri Gate, Sarai Kale-Khan Bus Terminus and Anand Vihar Bus Terminus.